“Where are your ears? Where are your ears? Welcome to Early Years Music Groups. I’m Wendy Prevezer, founder and facilitator of the Beeston-based groups that promote early social and communication skills, and a special bonding experience for you and your child. 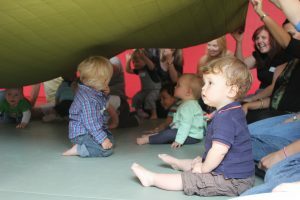 There are many activities available in Nottingham and Derby for babies and toddlers. In fact, there is so much choice it can feel a little overwhelming! You are looking for something fun, interactive and flexible to benefit your child and leave you both feeling good. Perhaps you’ve already tried some groups; maybe you are after something fresh and original. …which might just be my cue. I was inspired to start Early Years Music Group back in 1996 when I realised there was nothing of its kind for babies or toddlers in the area. I had so many songs and resources from my work with children who had additional needs, and were at the early stages of learning to interact and develop speech. I wanted to benefit my local community by sharing these activities with children both with and without additional needs. It began as an idea I knew I could do, quickly becoming something I wanted to do, and then something I simply had to do. I have remained with the under 3s all these years because it is a wonderfully fun age group to work with and I love the pure innocence, enthusiasm and lack of self-consciousness of young children. I play all my own instruments in the group, ranging from Autoharp and Ukulele which feature weekly, the African Djembe drum and other percussion, to the occasional clarinet. 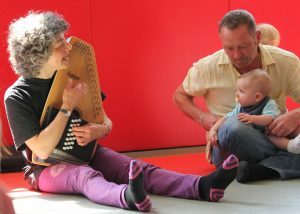 In each session, babies and toddlers enjoy experimenting with instruments, controlling elements of the group – ‘Ruby is wobbling! Shall we wobble?’ – and playing an integral part in both regular and changeable elements such as spinning, dancing, and playing with puppets and our seasonal themed props. I love sharing the joy of music, and the happy, smiley faces I see reflected back at me each session. But the best part of what I do is facilitating interaction and special moments between a little one and their parent or carer. EYMG brings out the best part of me, and for those 45 minutes each week away from work and to-do lists and tiredness and all of the worries that come with parenthood, I think it brings the best out in each family too.